Home / UncategorizedChoose the Right TV Unit!! Choose the Right TV Unit!! TV units have become so much more than just a place for putting your beloved TV. The reality is that the TV unit for many of us is the focal point of our living room. And if statistics are correct, we apparently spend an average of 4 hours per day watching TV. It’s our go to place for pure entertainment and relaxation at the end (or the beginning) of our day. TV units offer a host of functions – they can be used as a storage unit, wall shelving, display nooks and even electronic and media storage. There are number of factors that have to consider before choosing the right TV unit. Here are some basic tips that will help you in Choosing the Right TV Unit. The basic thing which you need to consider before selecting the TV unit is size of the TV. It should be able to fit the in the panel and should not be too big or too small. TV comes along with its digital accessories like the cable box, USB wires and more. A TV unit should be able to provide good support for these as well. A good suggestion would be to opt for the one which is wider than the TV so that they complement each other by maintaining a proper proportion and balance. The size of the TV includes its weight as well. If it is on the bulkier side, opt for a TV unit which is sturdy and can withstand pressure. 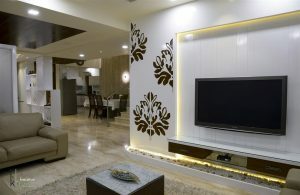 TV unit has to be well complemented with the entire room and not just the television. So, selecting the TV unit that fits the size of your room is very important. If you have big room, opt for a unit which has a lot of storage space. For a room with space crunch, choose a sleek and sturdy TV unit. Choose a TV unit which endows you with enough storage to keep the TV accessories intact as well as other stuff which can be housed inside it. If you have sound speakers or other big devices, then you might need more spacious storage furniture. Just like all the furniture items that are reflecting your taste and choice in your home, a TV unit design should also be able to do the same. The TV unit design should complement to the rest of your interiors of the room. Find the right oven for your kitchen!!! DESIGN A PERFECT HOME THEATER! !